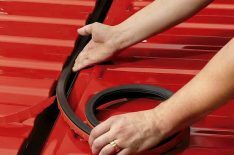 Stop those ugly dings and scratches from ruining your tailgate. Get a tailgate cap or tailgate protector. Crossed carries tailgate protection from brands like Husky Liners, and Lund.